Read 2 times. Last read March 1, 2017. A touching novella about a grandfather who suffers from Alzheimer's and his grandson. It's written in a stream of consciousness style, which would have become tiresome in a full length novel, but was perfect in such a short book. This was both heartwarming and heartbreaking, maybe made more so now that I'm a grandparent myself. This was a lovely way to spend an hour or so. Highly recommend! 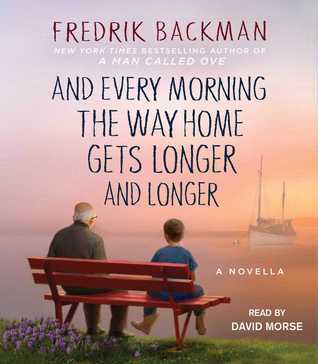 Sign into Goodreads to see if any of your friends have read And Every Morning the Way Home Gets Longer and Longer. Iris, you should and you'll be in for a treat. I would recommend A Man Called Ove as a great place to start. You're the second person I've seen give this a glowing review. It seems to have a lot of emotional impact. Beautiful review! Cat wrote: "You're the second person I've seen give this a glowing review. It seems to have a lot of emotional impact. Beautiful review!" Cat, thank you! I hope you give it a try and enjoy it as much as I did. I've put a hold on this book at the library and will pick it up in a day or two...have to finish current book first. Jan, this sounds lovely. It's going on my TBR list! Marilyn wrote: "I've put a hold on this book at the library and will pick it up in a day or two...have to finish current book first." Alecia wrote: "Jan, this sounds lovely. It's going on my TBR list!" It's a quick read and very touching...I hope you like it! Marilyn, I'm so glad you enjoyed it! Backman certainly has a way with words doesn't he? I didn't know he had no intention of publishing it....I assume because he has a parent or grandparent with dementia. Sad, but I'm so glad it was published. da wrote: ""heartwarming and heartbreaking' - yes! well said, Jan"
Jan, I do agree ! Loved this book !